Quail many not be the first fowl you think of when choosing birds for your homestead, but quail produce tasty, delicate meat and eggs, and they can also be sold to hunting preserves as game birds. Plus, they are quirky and fun to watch. Raising this tiny poultry can stoke a lifelong passion for homesteaders looking to raise unconventional backyard fowl. Here is what you need to know before deciding whether raising quail is right for your homestead. Are quail easy to raise? Quail are smaller than many of their backyard poultry counterparts. Experts say they generally require less space than other backyard poultry. But even though they are small, quail present their own challenges. Because quail can fly, their enclosures need to be extra secure, and they are more vulnerable to predators because of their size. Quail are also susceptible to disease. To keep diseases at bay, keep quail separate from other backyard fowl such as chickens and try to keep them away from wild migratory birds. What do you need to raise quail? To raise quail, you will need a proper enclosure, feeders, waterers and nesting boxes if you want them to lay eggs, either to hatch or for you to eat. You also may need a permit from you state department of fish and game depending on the size of your quail “covey” (a group of quail) and what you plan to raise them for. 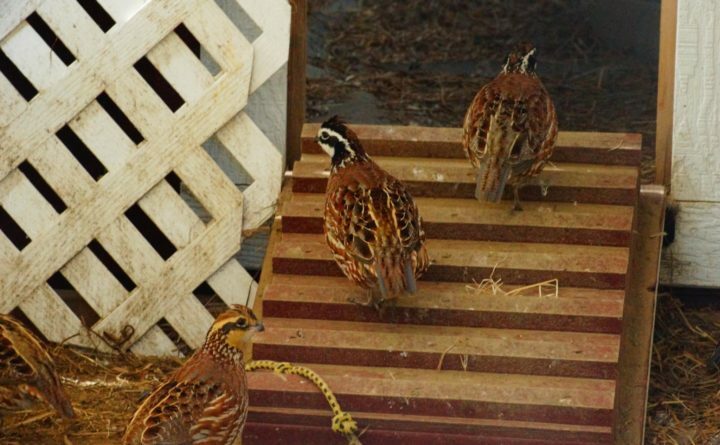 Some districts prohibit raising quail entirely, so check your municipal zoning codes as well. How much space do quail require? “They don’t require a ton of space, it just depends on your numbers,” Lhamon says. The Penn State Cooperative Extension guide recommends 1 square foot per quail in floor pens. Chickens, by comparison, require about 4 square feet per bird. Because quail are territorial, they also will need adequate space at feeders and waterers — about 1 inch and ⅓ inch each, respectively. The rearing conditions will also vary based on what purpose for which you plan to raise them. Hunting preserves want fast-flying birds, so they will need more space in their cages to spread their wings. Birds raised for eggs and meat will need more controlled temperatures and less light. How long does it take for quail to lay eggs? Interested in quail eggs for eating? The delicate eggs are a common part of some international cuisines and a delicacy in others. In some South American countries, hard-boiled quail eggs top hamburgers and hot dogs, and Vietnam, boiled quail eggs are sold in bags as snacks. Meanwhile, in Japanese cuisine, quail eggs are eaten raw in fine sushi. Quail eggs are about one-fifth the size of a chicken egg and have brown spotted shells. Between the ages of 2 and 8 months a female quail will lay about one egg per day and can lay between 150 and 300 eggs per year. After about 9 months, the productivity will decline. Most quail live for less than a year in captivity. For ideal laying conditions, quail must be well-fed (there several commercial quail feeds available on the market, and a calcium supplement will also help with egg production) and receive 14 to 16 hours of light per day. Like any livestock, quail come with their unique challenges and opportunities. Now that you know the basics, you can decide if you want to venture into raising quail on your homestead.